These DIY felt bunny kits contain all the supplies you would need to sew a handful of mini felt bunnies! These craft sewing kits are fantastic as a fun rainy day craft project or as a gift for your favorite crafty friend. My sewing projects are meant for hand stitching. 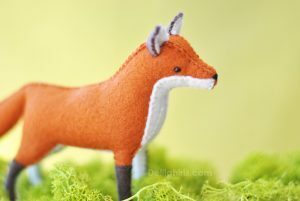 A perfect felt project for anyone new to hand sewing. Each kit contains hand stitching diagrams and instructions. All of these felt bunny craft kits are meant to be hand sewn using felt. Sewing with felt is very forgiving! That is what makes this kit such a wonderful project to those learning to make their own stuffed animals, or new to hand stitching. Felt bunnies make a perfect gift! Give the finished bunnies as a gift, or the kit itself! Each bunny is perfect to fit inside an oversized Easter egg, making them perfect as Easter basket surprises! You could even sew a string into the top and hang them as ornaments! What a lovely craft to learn, and a relaxing project for a quiet afternoon. I’m so happy you’ve decided to sew with me!